Today’s Feature Friday spotlights one of our retail partners in Georgia: Madeleine Page. Madeleine Page opened in 2005 in Greensboro. The shop carries footwear and accessories for men and women. Greensboro is a small town an hour east of Atlanta. During the final years of his life, Mickey Mantle – 7-time World Series Champion and member of the MLB Hall of Fame – lived on Lake Oconee near Greensboro. Today’s Feature Friday spotlights one of our retail partners in Louisiana: Iron Horse Clothier. Joe Caldarera opened the store in Metairie last November. Iron Horse, named after a nearby railroad, carries menswear along with a selection of women’s items, gifts, and home decor. The unique store has an intentional rustic feel that Joe says “represents an earlier time, when things were simpler, a time when things were slower, when quality and customer service were of predominate importance.” Read more about Metairie here. Shopping for Father’s Day can be a challenge. We’ve made it easier with our Father’s Day Gift Guide. Shop our guide for gifts your old man will be sure to love. 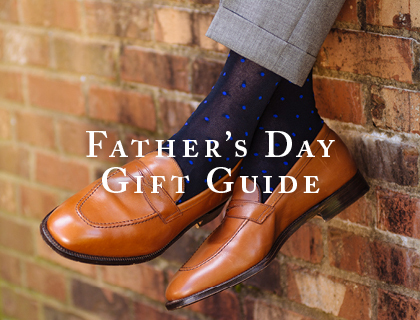 Show your dad how much you care for him with Dapper Classics socks, ties, shirts, or trousers that are carefully made in the USA.